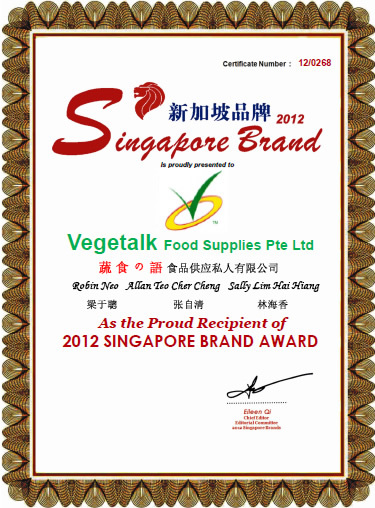 Vegetalk Food Supplies Pte Ltd (Vegetalk) established in Singapore in 2003, Singapore's well-known vegetarian food supplier. We mainly supply seasoning using mushroom granule, an extract from mushroom It is natural, healthy and contains No MSG. We also supply all kinds of wet and dry vegetarian food, vegetarian buns, vegetarian snacks and other products. Our products are sold in local supermarkets like NTUC, Prime, Sheng Siong, mini markets, vegetarian restaurants and organic shops. We also sell to foreign countries such as Malaysia, Vietnam, United States, France, Myanmar, Indonesia, Guam Island, Australia and New Zealand.